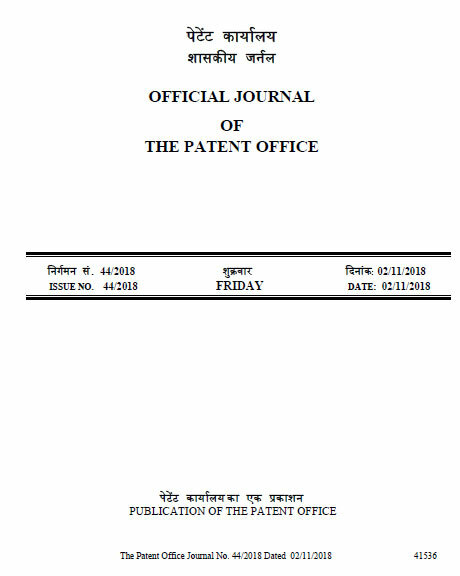 Mr K.Sundara Kumar is working as Faculty & HOD in Civil Engineering has filed a patent for his research work which is published in the Nov-2018 issue of Govt journal of patents. His research work is related to urban climate modelling. Urban heat island is one of the serious environmental issues related cities. High land surface temperature is the reason for this problem. This land surface temperature again depends on vegetation, water bodies & built-up areas. For studying land surface temperatures, normally satellite images are used which are covering large areas and synoptic view. Particularly thermal band images are required to develop land surface temperature images. But these thermal band imageries are not available in all the satellites and are scarce. For example, our Indian satellites, IRS series, though having very high resolution to map land cover details, does not contain thermal bands. So we have to use LANDSAT or MODIS imagery which are US based. Even though obtained from NASA and other agencies, some images may contain errors due to cloud coverage or absence of data due to other technical issues. 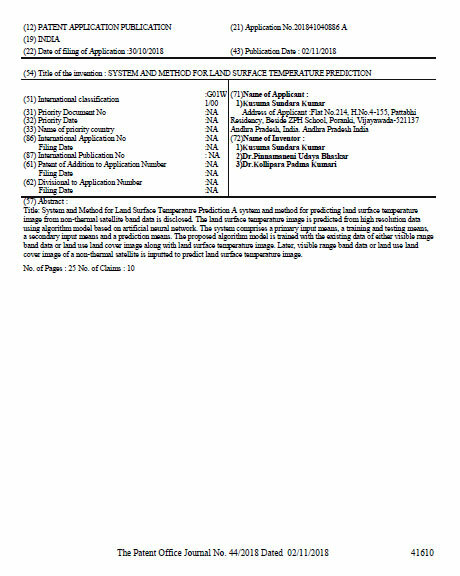 Hence to solve all those issues, the research done by the author is focussing on developing land surface temperature images from non- thermal band imagery. He developed a model using artificial intelligence Concept. Artificial Neural Network which is a part of Artificial intelligence is used in this research work for prediction of land surface temperature image from available non - thermal band satellite imagery. The outcome of the research is immensely useful for prediction of land surface temperature image of an area for which no thermal band data is available. Prediction of land surface temperature images is very essential for study of Urban climatological changes and for planning various mitigation measures, that can save urban areas from the evil effects of urban heat island. 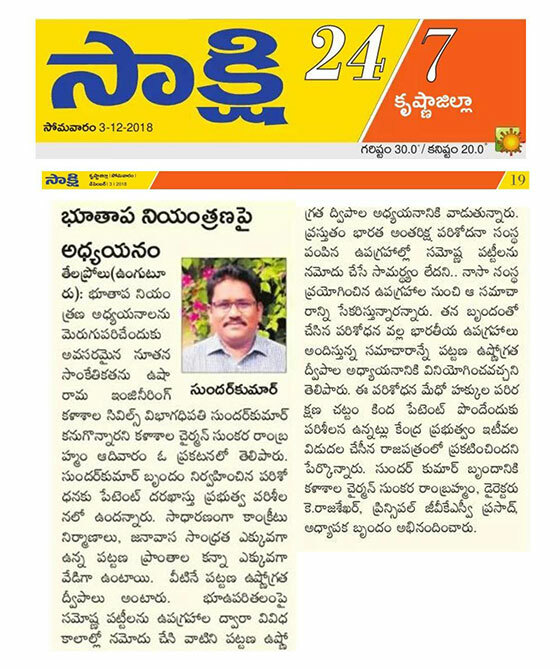 This research is part of the Ph.D. work of Mr.K.Sundara Kumar at JNTU-Kakinada under the guidance of Dr. Pinnamaneni. Udayabhaskar. Chairman, APPSC and Dr. K. Padma Kumari, Prof of Civil Engineering JNTUK, Kakinada. The major innovation of this work which makes it eligible for patent filing is that, it solves the problem of non- availability of thermal band satellite imagery which is essential for study of urban climate. 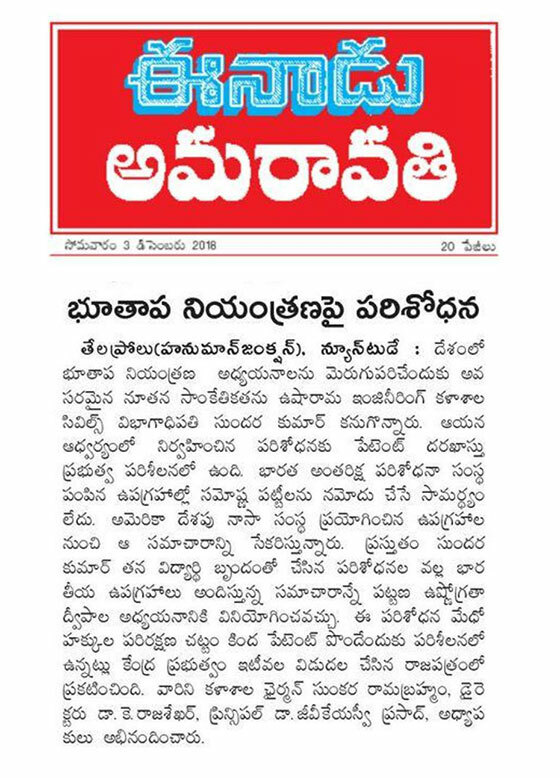 The management of the Usha Rama Engineering college sri.Sunkara Ramabrahmam, Director Dr.K.Raja sekhara Rao & Principal Dr. GVKSV Prasad have appreciated Mr. K.Sundara Kumar upon his successful attempt of filing his research work for patent.